Keiichi Sumi Wallpaper: . :TEH CONQUEROR!!!11:. Minitokyo »	Keiichi Sumi Wallpapers » Keiichi Sumi Wallpaper: . :TEH CONQUEROR!!!11:. Agenda: I always wondered how would a half grunge wall and a half scenic/vector wall would actually turn out either in a good or bad way. So i tried it out my self. I first downloaded the needed brushes for this half of the wallpaper. The scan speaks for it self! After im done brushing down, i started to vector a nice looking rock mountain landscape. With the right colors and shadings. Added a reflection to the finished landscape, to make it look like as theres water surrounding them. Added some flying birds, added a clould like layer. Added some few textures to the wallpaper, and added some stars. As I said on AIM, it's nice. The simplicity of the BG, the colors and the scan matches well. A fav. Yeah, I was thinking the same thing as white-zero with da paper scenic look but it's still good. very nice wallpaper. i like the theme. 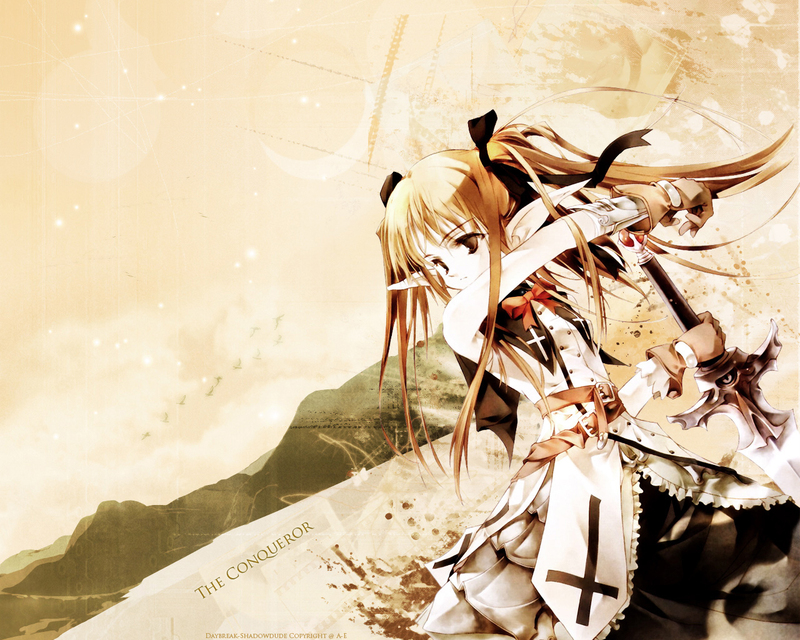 and the title "the conqueror" she doesnt look tough XD. great job. keep it up. One word...hot! The single color really brings out the most in this wallpaper. The left side has plenty of space so that all the desktop items could be seen while the right contains the character (whoever would do the opposite must really be slacking on their life). The text placement is very unique and concurs with the wall really well. With all and said, bring back the grunge! .... SO PRETTY! T.T good jobbbbbbbbbbbbbbbbbbbb~ keep it up! i like the simplistic bg! the soft color of both scan and bg fit really well! Simple, yet beautiful. Scan is very cute too. i like the perspective of this wallpaper... the bg is sorta tilted and this makes it look real cool... i also like the colors and the paperlike effect, mainly jus because i like sepia tones, but still... real nice wall! the grunge + sceneric blend idea is kinda nice. nonetheless, the birds and mountain is really nice done. very good work on that. the scans looks nice though I still see some white-ish along the edges of her hair.